Sweet Ideas the Cake Shoppe in Robert, Louisiana crafted this delightful cake for a wedding at the Fleur de Lis Event Center in Mandeville. 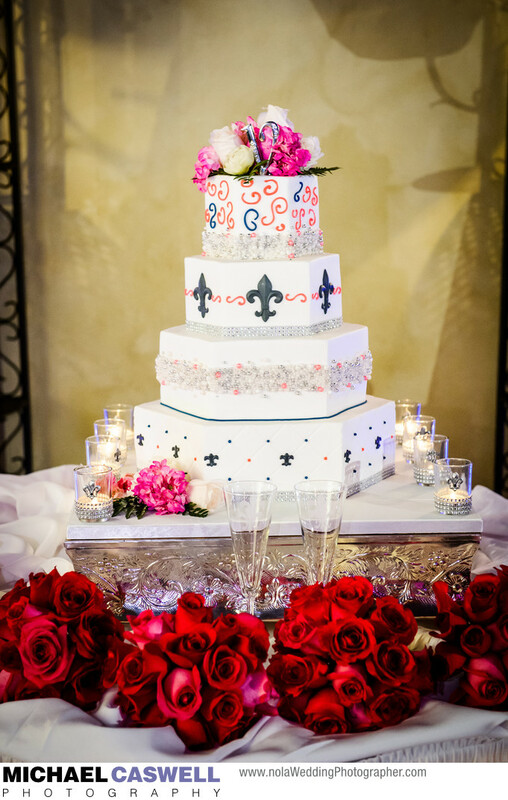 The cake itself is adorned with multiple instances of the fleur de lis, a symbol that traditionally represents French royalty but is closely associated with New Orleans, and is actually the official symbol of the State of Louisiana. The gorgeous floral arrangements were created by Beth's Flowers in Metairie. The Fleur de Lis Event Center was the setting for this couple's wedding reception, with their ceremony having taken place at Our Lady of the Lake Catholic Church. This wonderful Northshore venue was actually once a movie theater, but was beautifully reimagined and renovated, turning it into a fabulous location for a wedding in Mandeville. Other great locations in this area include Maison Lafitte, and the Maritime Museum in nearby Madisonville. Location: 1645 N Causeway Blvd, Mandeville, LA 70471.